Engaging youth for a more sustainable, inclusive and engaged global community is a goal that is shared by both the IFD21 as well as UNESCO-MGIEP, the only research institution of UNESCO in Asia. Their annual conference called Tech 2018: Transforming Education Conference for Humanity in Visakhapatnam in partnership with the Government of Andhra Pradesh aims to bring together and synergise like-minded individuals and organisations working towards the same goals. 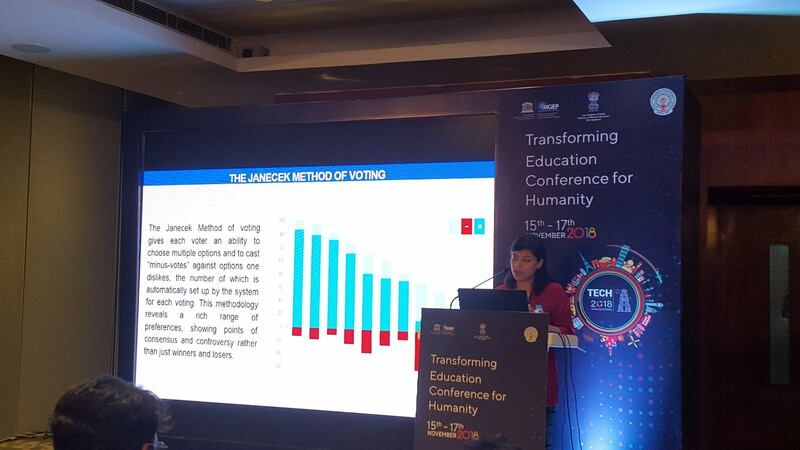 Ankitha Cheerakathil, the Executive Director of Foundation for Community Consensus (FCC) – the Indian office of the Institute – was invited to speak in a session titled ‘Digital Tools for Student Empowerment’. She talked about the sense of empowerment and community belonging that students in India who experienced School Participatory Budgeting (School PB) felt. In particular, the digital participation platform that is used during School PB and which employs the Janecek Method for prioritising the students’ preferences and priorities regarding their school was well received by the conference attendees. There was considerable interest in replicating the Janecek Method in educational institutions all over India by other civil society organisations.